I once called this dress "one of the most polarizing" dress I own in a previous post about my vintage 70s dress collection. In fact, I would say now it's probably the most polarizing dress I own period! My mom thought spending $12 on it was $12 too many (although got really excited to stage and direct a photo shoot around it...) and my friends either love or hate this dress. Though it doesn't get photographed every time I wear it (that occasionally happens to us fashion bloggers...) it's one of my go-to outfits because it's a) colorful, b) comfortable, and c) fun, and d) retro, e) is versatile for all seasons and f) is easy to pair with various cardigans, purses, and shoes. 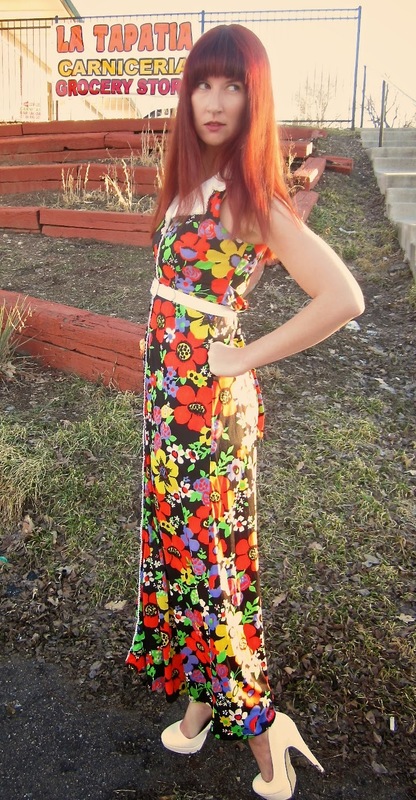 I found this dress at the Buffalo Exchange in the "hipster" neighborhood of Denver. For those who are unfamiliar, Buffalo Exchange is a place where you can trade in or sell your relatively recent and trendy clothes, but they also carry vintage as well. Given that this BE is in the more fun part of town (in my humble opinion), it makes for some very nice finds and not strictly last season's "mall fashion"! This dress is especially fun because there's so many options to pair it with, but white has been my staple for styling this dress all throughout the fall and winter. Sometimes maxi dresses are super fun because they're comfortable but also dressy, so if you can make it a 70s style or true vintage one, it's double the fun...which is why I love this dress so much! Plus I own a Kate Spade bag that closely resembles the print! What fun! Thank-you! Vintage is my favorite! By the way I've started following your new IG account. Stunning colors <3 You look absolutely fantastic! Thank-you! 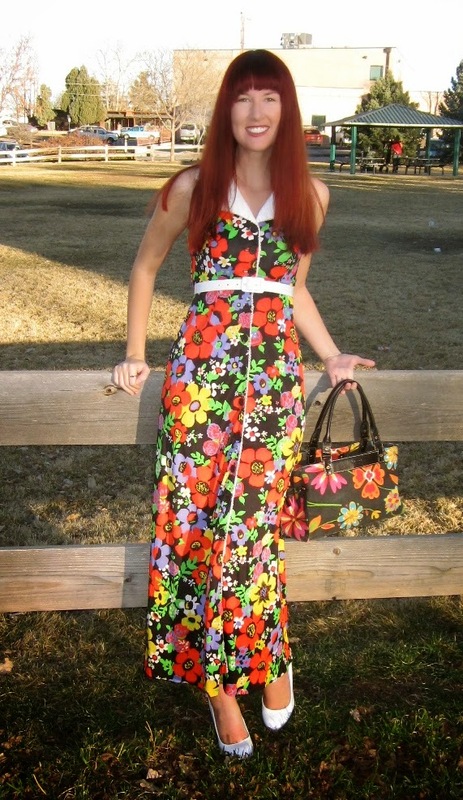 The 70s is one of my favorite eras in fashion! !